Airport services agents, Ground services agents, what type of job they do? The ground services agent or assistant assists passengers at the airport. 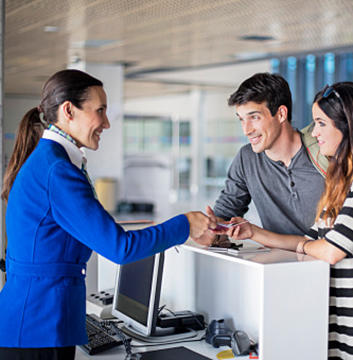 They carry out the registration of passengers and baggage ( check-in tasks) and facilitate the correspondence formalities, and they ensure as well the quality of the ground handling. The ground services agents will coordinate the activity of teamwork. They must assure the responsibility for a stopover. Main activities : Announcing of commercial and operational messages, handling of baggage lost complains, providing special needs for elderly and handicapped passengers at the airport, ensure that each allocated flight during their duties take off on time, etc.. Following up the meals catering services for the flight and other prerequisites and special needs. Their primary duties are at the airports, in direct contact with the public, providing and deploying different services at the terminal. Sedentary activity requires the permanent use of telecommunication means as well computer tool. They work on shift hours duties seven days a week on a rotation basis. Wearing a uniform is required at all time while they are on duty. What includes in their training? This job is accessible from 20 years old with a special passenger handling training and examination is required for the obtaining of an accredited degree of hospitality and special handling. Besides training, some often companies might require a business experience. The hiring company provides some extracurricular vocational training during employment. -Fluent English (read, written, spoken) is required as well as other languages related to customer services. KNOW-HOW : The ground agent must comply with the following: Work permanently in contact with the customers. Adapt to the diversity of people and situations. Satisfy customer demand quickly. COMPETENCE :The ground agent must be able to: Welcome, and guide passengers in the airport terminal. Save and proceed to specific baggage checks. Check the registration and boarding passengers. Assist passengers with the delivery of their luggage. Finally, with many different training schools available both regionally and internationally, the Institute INFOHAS is among the top choices of airlines seeking to recruit new and well-trained graduates to fill Airports services agents, flight Attendant, customers services agents and hospitality job positions.